The Phalaenopsis mannii is a beautiful and well-known orchid from Asia, which brightens many living rooms. The strikingly colorful flowers, which can bloom for months on end, have contributed to the popularity of this exotic orchid. The Phalaenopsis mannii orchid originating from Asia is a very popular houseplant. 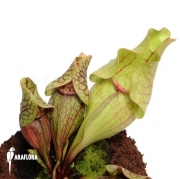 Its inflorescence is magnificent, while the plant itself is easy to care for. There are many species of Phalaenopsis orchids , each one different in size and inflorescence. Most species of this orchid have large pink or white flowers. The leaves are relatively small, thick and of a dark green colour. 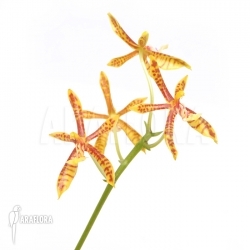 ARAFLORA loves to provide these species of orchids whose flowers give such lasting enjoyment. The Phalaenopsis mannii is one of the best orchids for cultivation indoors. This orchid needs a great deal of light but cannot be in the full sun. Once a week a little water is enough. It must not take too long for the water to be absorbed or else the roots could be damaged. This orchid can deal with any temperature between 15˚ and 30˚ Celsius [ 59˚ - 86˚F ]. A helpful hint from ARAFLORA on how to water the Phalaenopsis orchids : Water the plant when the orchids’ roots are grey in colour. An hour after watering the roots will change from grey to green. A light-green colour is the colour you want.